SlickPanel is a modern panel that provides common tools such as a list of open windows and an indicator bar. Make it easy to hack on! When I switched to Oneiric, I tried Unity and GNOME Shell however I found I preferred my classic setup of GNOME Panel and used a external application launcher. However, I was surprised to find that GNOME Panel had not very well maintained in Oneiric. In fact it is buggy and I had to go through some effort to get Indicators working on it. After looking at GNOME Panel and other options (such as wingpanel) I realised there was not a quick, stable, extensible (and pretty!) 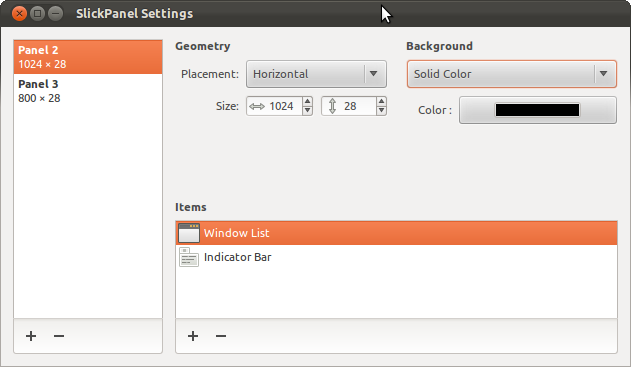 desktop panel for GTK. So… what exactly does Slickpanel better than the “original” one? I noticed a few times now I think, that there are tutorials for installing all kinds of apps, but without any reason at all *why* I should install them. I really don’t have time to install (and deinstall) useless apps that don’t give any advantage to what I already use, so please, if somebody gives instructions like these, at least give us some good reasons why we should install apps. Otherwise I will most probably ignore these posts completely in the future. Stephan, you’re right. This site provides a large list of OSS projects, but everyone should use his own head to decide which application to install. I like this SlickPanel. It’s plain and simple but lacks options like positioning the panel. This panel could be very useful in other desktop enviroment (not in Gnome) – e.g. Openbox. In Openbox you do not have any panel by default, and you could install anything you want. Thanks for the explanation. Would have been nice if something like that was written in the original article, so users at least know what they’re dealing with. Call me lazy, but my problem with these kinds of tips is that I don’t see a point in installing an app with features I have no clue about. If I actively look for an application I am willing to investigate that time. But if I get a “tip” about some random app I’ve never heard of and don’t even get the slightest clue on *why* I should bother to install it, the tip becomes rather useless. More than often I just found that the apps mentioned here are not what I am looking for and I begin to lose my interest in reading these tips at all, because of that lack of information. Having said that, I *did* install SlickPanel out of curiosity but wasn’t even able to get to its preferences dialog. Which brings me the other point, that, if such an app is presented on this site, maybe some tips about actually using it would be nice as well. Just some buzzwords taken directly from the developers’ site will simply not be enough in the future for me to even bother installing any of these apps. I’d try to be a little more polite about it, but I definitely agree with your point. I’d be nice if there was more explanation provided for some of the posts here, explaining why someone would be interested in using these programs. Sometimes it’s obvious, like when you’re just talking about an update to a program that’s already popular, but with posts like this one, it’s be great to have more info. I have updated with application developer comment on why he made this application hope it will help . Thank you very much. That’s a starting point. @ cgalax: I don’t see that I was impolite and if I was, I’ll say sorry to anybody who thought so. (If I intended to be impolite, you’d have noticed it for sure 😉 ). I am just kind of tired to waste words and time on something that seems obvious to me. I have done that too many times, so I try to get straight to the point. My posts were never intended to annoy or insult somebodies’ work. I am still grateful for the free work that is done here and on other sites. But still, even free work should be presented in a way that makes it worthwhile for others to use it. If it doesn’t, there is not much point in providing it.